A time-honored tradition of Father’s Day remains the backyard barbecue. Hamburgers and hot dogs usually top the menu, but consider some healthier alternatives. We all want to have dad around for a long time. Viva la veggies: If your idea of a veggie dish for your barbecue is potato salad drenched in mayonnaise, think again. As an alternative to the spud salad, consider some of the many recipes online for healthy vegetarian dishes for your cookout, such as Portobello mushroom caps stuffed with cheese, olives and tomatoes. The mushrooms can be grilled to smoky perfection and satisfy even the burger-eaters in the crowd. Go with fish: The American Heart Association has some not-so-surprising advice when it comes to barbecue menus: Grill fish more often. According to the AHA, the healthiest kinds of fish to select include salmon, trout and herring, since they are high in omega-3 fatty acids that are good for the heart. This healthy grilled salmon recipe is perfect for grilling out on Father’s Day. Beyond chicken wings: Chicken is another good grilling choice. Boneless, skinless breasts are the healthiest cut, diet and health experts say. The biggest challenge is keeping the breasts moist on the barbecue grill because the high heat of the grill is a natural enemy to the chicken breast’s lean meat. Some solutions to the dilemma include choosing the right rub or glaze, pounding the meat, closing the grill cover while cooking, and even cooking under a brick. For the best burgers: For dads who can’t live without a burger, the American Diabetes Association offers some tips. The ADA says the best burger choices are 93 percent lean ground beef or lean ground turkey. Alternatives to meat patties include homemade veggie burgers or black-bean burgers. For a veggie boost to any burger, choose healthy toppings such as lettuce, spinach, mushrooms, or slices of tomato, onions, or pepper. Use ketchup sparingly, due to the sugar content. Consider mustard instead. Considerations for the sauce: Barbecue sauce can have a significant amount of sugar in a relatively small serving, according to the ADA. It recommends being conservative when using barbecue sauce on meat. As an alternative, use lower-calorie marinades. Fewer calories doesn’t have to mean less flavor though. If your dad loves barbecue that’s sweet yet savory, try this ADA recipe for grilled mango chicken, which calls for either salsa or chutney..
Healthier nibbles: Many people serve chips, pretzels and other salty snacks at their barbecues, along with fatty dips. Healthier noshes wait to be discovered! A tasty selection can be found on the AHA’s “Snacks and Appetizers” recipe page of its website. For example, the “Take-a-Break Snack Mix” includes healthy ingredients such as sliced almonds and unsweetened cranberries and blueberries. A word about charcoal grilling: Much has been written about the possible dangers of blackening meat or other edibles on barbecue grills. 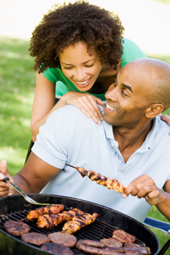 In particular, concerns have been raised about a potential link between barbecued foods and colorectal cancer. Health experts at the University of Texas MD Anderson Cancer Center say there are measures you can take to mitigate potential risks, including to trim fat and marinate meat at least 30 minutes before grilling.